In association with The Royal British Legion, Burnley FC in the Community support the local armed forces veteran community within Burnley and East Lancashire through sessions and opportunities to improve their overall wellbeing. 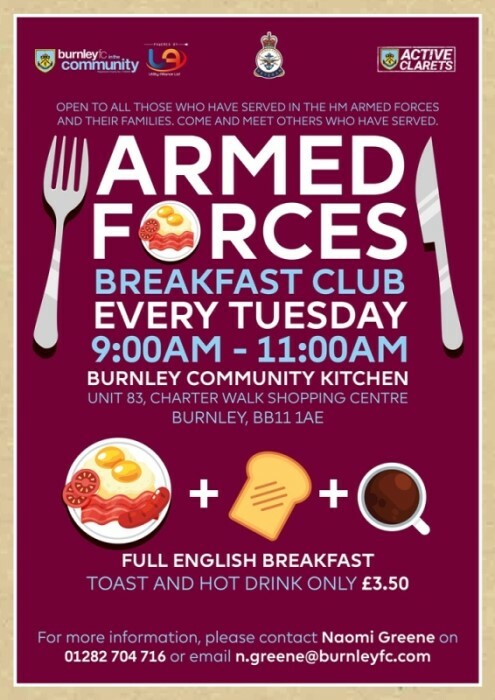 Burnley FC in the Community are proud to host an Armed Forces Breakfast Club for the armed forces community in and around Burnley. Their Armed Forces Breakfast Club allows people from the armed forces community to come together, socialise and enjoy each other’s company. It provides the chance to rediscover the camaraderie and unique banter proudly recognised within the armed forces, while also enjoying subsidised full English breakfast and unlimited hot beverages. Through the breakfast club there will be support networks for individuals seeking welfare, housing, employment and training support. BFCitC’s Armed Breakfast Club takes place every Tuesday morning between 9am – 11am at the Burnley Community Kitchen, which is located above New Look at the Charter Walk Shopping Centre in Burnley town centre. Veterans have the chance to engage with other members of the armed forces community, engage with the Burnley FC in the Community Health and Well-being team and find out more about opportunities and activities happening in Burnley and East Lancashire. Veterans can also engage in many of our organised activities, events and trips. • Social Session - Thursday afternoons, 1-3pm at Turf Moor. Burnley FC in the Community have engaged with over 150 local military veterans to improve all forms of health for those within the armed forces community. This has been in the form of trips to other breakfast clubs and museums, health workshops, organised lunches, outdoor activity days and much more! Burnley FC in the Community also offer opportunities to gain qualifications and routes into volunteering or employment! Since coming out of the forces, have you been wanting to gain sport-specific qualifications? At the Burnley FC in the Community, they can give you experience and opportunities to gain Football Association (FA) qualifications, as well as First Aid and Safeguarding training. Burnley FC in the Community specific Employability team can help you gain experience, teach you how to show off your qualifications on a CV and help you find employment. Burnley FC in the Community is a recognised Bronze Award organisation for the Armed Forces Covenant Employer Recognition Scheme (ERS) for commitment to the armed forces. To find out more about the Veterans programme please contact Naomi Greene, Health and Wellbeing Officer, on n.greene@burnleyfc.com or 01282 704716.